Travel Tip: Interact with the local people! “Don’t worry. We’re playin’ fer pints.” The three Irish college boys smiled up at us from the card game they had invited us to join. “Pints? But I don’t drink,” Rob responded. Not an unreasonable response considering that we were on the Emerald Isle, the home of Guinness Ale. “Pints of what?” repeated my confused husband. Rob and I were on the ferry returning to our B & B in Galway after a day spent exploring Inishmore, the largest of the three Aran Islands that float off the western coast of Ireland. Our day had started early with a ride through the green countryside on a double-decker bus to the ferry stop in Rossaveel. We boarded the morning ferry to Inishmore under grey and gloomy skies, but as we approached the little village of Kilronan, the sun broke through and it appeared we were in for a great day. 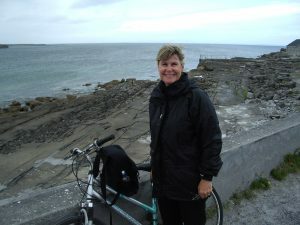 We immediately rented bicycles from Aran Bike Hire on the pier and set out to explore Inishmore. Our destination was Dun Aengus, a Bronze Age stone fortress at the far end of the island. We had the choice of the high road through the center of the island or the low road along the shore. My athletic husband chose the high road. Rob zipped effortlessly up the hill while I pedaled furiously and fruitlessly behind him. I was about to give up and walk my bike the rest of the way up when I remembered that bikes have gears. I had been trying to pedal uphill in high gear! Sheepishly, I shifted down to first gear and caught up with Rob, waiting patiently at the top of the hill. The rest of the ride was easy as we journeyed along the top of the ridge, the narrow island spread out below us – a barren, wind-swept land of limestone and miles of the hand-stacked rock walls that are so common throughout Ireland. Early settlers of the mid-17th century created a thin layer of topsoil with mixtures of sand and seaweed, which provided the means for growing potatoes and other vegetables, but on this June day, the soil also provided a home for thousands of wildflowers in pink, purple, yellow, and white, blooming on every hill. 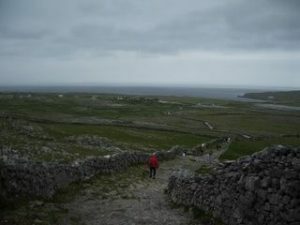 The brooding black rock walls of Dun Aengus dominated the hilltop at the end of our ride. We parked our bikes and hiked up a steep path through the rocky fields to the fortress. 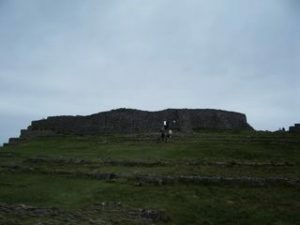 The weather had been fine as we began our ride, but as we approached the fort, the skies greyed and the wind began to howl around us on the stony hill, creating a sense of being swept right back into the Bronze Age. The fortress itself, while large and imposing, is now just several rings of tall, thick walls surrounded by a defensive system known as cheval de frise – sharp stones placed into the ground in an upright position. More impressive even than the building is the setting. Dun Aengus is perched so close to the edge of the 300 foot cliffs that some of it has now fallen away into the sea far below. 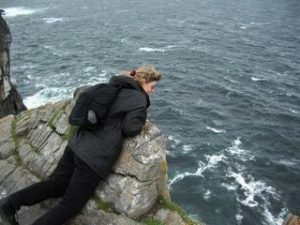 The wind was gusting so hard that we had trouble keeping our footing and both went down on our bellies to peer over the edge to the sea. Peering at some of the remains of Dun Aengus far below. After some time exploring the fort, Rob pointed to the dark black rainclouds that were moving in fast, so we hurried back down the long, rocky path to our bikes. Just as we got to the bikes, the skies opened up and the rain started pouring down. Rob pedaled quickly ahead of me and missed the turn to the “low road,” the road back to Kilronan along the shore. I didn’t feel up to tackling the big hill in the rain, so I turned toward the sea and pedaled along the empty roads with the wind and rain in my face, and the stormy waters of the sea battering the shore below me. The wet fields were marked by a checkerboard of low stone walls and fragments of ancient stone buildings dotted the landscape. I felt surrounded by the spirits of ancient Ireland wailing in the wind. Returning to the modern world in Kilronan, I found Rob waiting for me outside a little café where I joined him, soaking wet, for a good hot cup of tea. Still chilled to the bone, we thought this would be a good time to visit the Aran Sweater Market where we watched a video about spinning and weaving in Ireland and I purchased one of the famous water-resistant woolen cable-knit fishermen’s sweaters. All too soon, it was time to return to the mainland. After a few rounds of poker, with a few million hypothetical Euros trading hands, Patrick offered to teach Rob the national card game of Ireland, “25” – the game that would be played for pints. The hilarity continued after Rob’s initial confusion. 25, or Maw, as the ancient game was called, seems simple enough. But the rules are completely illogical. The 5, for example, is the highest card in the trump suit. As play progressed, the boys kept throwing out new rules. After about five or six repeats of “we forgot to tell you,” Rob threw up his hands in despair. But all was not lost. We may not have learned how to play 25, but we did learn that the club suit in Ireland is called – what else? – shamrocks. By the time we got back to the mainland, we were all good friends, and the boys offered to drive us back to Galway. We chatted easily the entire way, answering their many questions about American politics, the death penalty, health care. The boys were remarkably well-informed about American issues and politics. This was one of those travel days that live forever in memory, made especially unforgettable by our encounter with the charming lads. Travel is a richer and more meaningful experience when one takes advantage of opportunities to meet and interact with local people. It’s worth more than a million pints! How exciting! This is up sooner than I expected and fun to read. I like the clean layout, the direct explanation of what is on the blog. We’ll see you tomorrow evening for dinner. Thanks, Terry! You are my very first visitor. Thanks for your support! Joan ~ I love this story with the photos, plus the tidbits of history and geography that you provide for us in your descriptive writing. And, the encounter with the three Irish students is priceless. You are right on the money about how interaction with the people makes such wonderful and lasting memories. 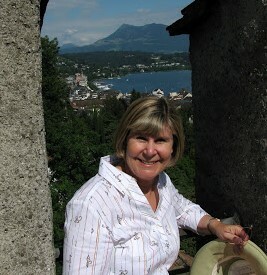 Your new blog looks terrific, and I am looking forward to seeing more of your terrific travel tales. Thanks so much, Annis! (You will probably notice several of your good editing ideas in the final story.) I’m looking forward to adding to this first post. Joan, I love your writing. You’ve painted a clear picture without going overboard on the description. What a fun story about playing cards on the ferry! Thanks, Kim! So glad to have you join my trip! What a fun post! Your cycling trip back to the cafe sounds wonderful! I look forward to following your adventures! Thanks, Kathy! I’ve been meaning to create this blog for a long time. I have a lot of stories to tell! This is wonderful especially as it acquaints us with the “locals” who are sure to become unforgettable characters in the novel that we hope will link to the blog. Brave, smart writer, you! Haha, Charlie. Nothing like a little pressure! Maybe someday I will be inspired to write that novel, but for now, I’m happy just to share my little stories. Thanks for commenting! Hi! I'm Joan. On this blog, I'm sharing travel tales to enlighten and entertain - and travel tips to make your own journeys easier and more fun! Click on my picture to learn more about me.